None of us really wanted to cook breakfast, so we started the breakfast casserole the night before by thawing the tater tots. 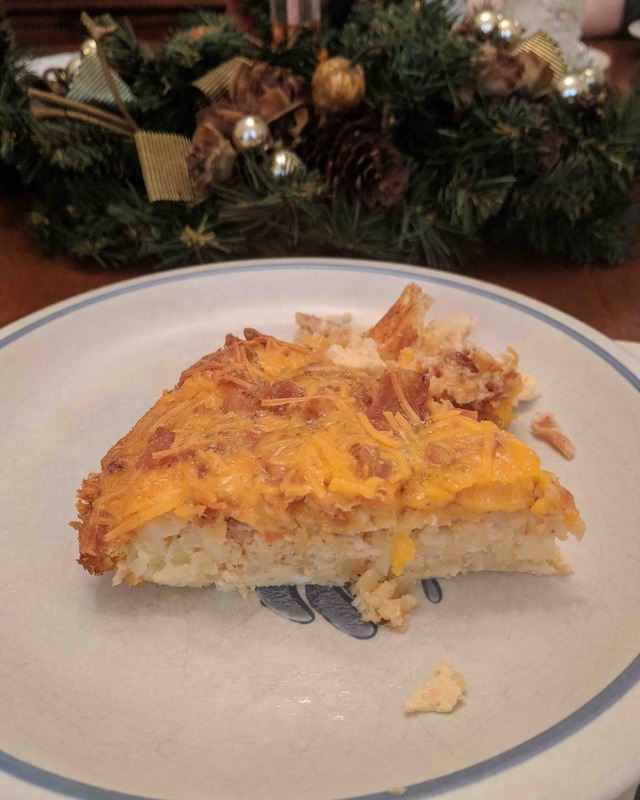 Hash browns would work as well, as we were trying to create a potato crust. 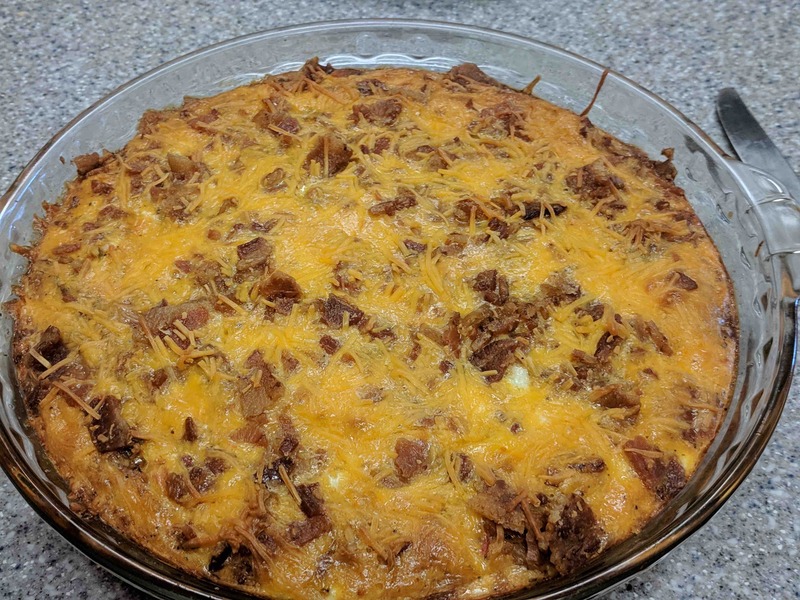 Adding a few eggs, milk, salsa, cheese, bacon and seasonings and putting it all to bake first thing in the morning, had a lovely casserole by the time everyone was up and about. The night before, butter a deep dish pie plate. Place a layer of tater tots to cover the bottom of the plate. Put the plate in the fridge for them to thaw overnight. In the morning, mash the tater tots with a fork to form a bottom crust. Scramble the eggs together with the seasonings, milk and salsa. Sprinkle half the bacon over the tater tots and pour half the egg mixture over. Sprinkle on half the cheese. Pour the rest of the eggs into pie plate and then sprinkle over remaining bacon and cheese. Let sit while the oven comes to 325 degrees F.
Bake 45 minutes to an hour, or until top is golden and bubbly. I’m always looking at other ways to get perfect soft boiled eggs. After trying this method, I can attest that the eggs were easier to peel and I didn’t lose any from cracks. Plus their interiors were exactly as I wanted, whether hard or soft boiled. The only difference is cook time. Just cook the eggs for longer in the steam and you’ll have perfect hard boiled, easily peeled eggs and pretty yellows. Cook for less and you’ll have soft but solid whites and runny yolks. Hard boiled – 12 minutes for perfectly done and creamy yolks. Cool eggs under running water. Peel gently, if soft boiled as the eggs will still be soft. 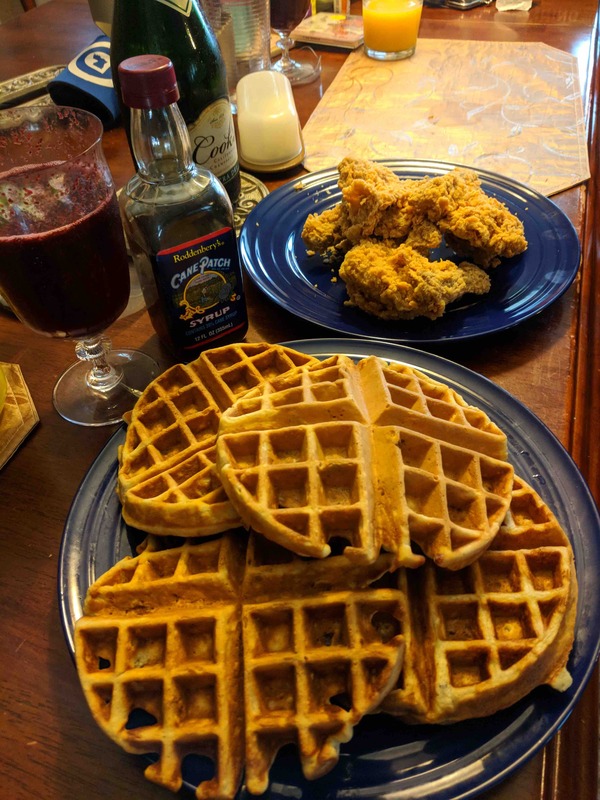 I love breakfast foods for dinner, especially when I’m having one of my favorite combos – fried chicken and waffles! This recipe makes six regular waffles or 4 Belgium style. We added toasted pecans to ours for an additional bump of flavor. Combine flour, salt and baking soda in a medium bowl. Whisk to combine. 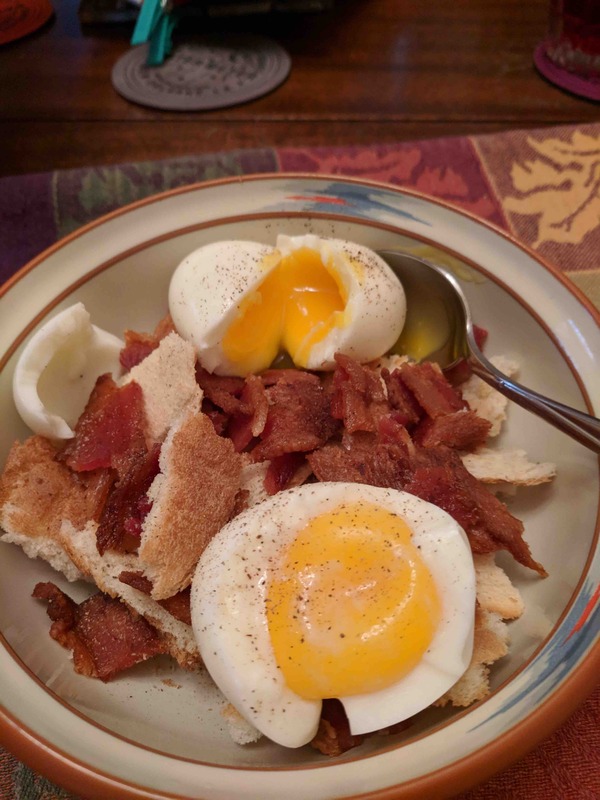 Lightly beat the egg in another medium bowl. Add the sugar, butter, and shortening and mix well with an electric mixer until smooth. Add the milk, buttermilk and vanilla. Mix well. Add the wet mixture to the dry mixture while beating. Mix only briefly. Leave the small lumps in the batter since over beating could produce waffles that are too tough. Rest the batter for 15 minutes (or overnight for even better batter). Rub a light coating of vegetable oil on the waffle iron or use a non-stick oil spray. Preheat the waffle iron. 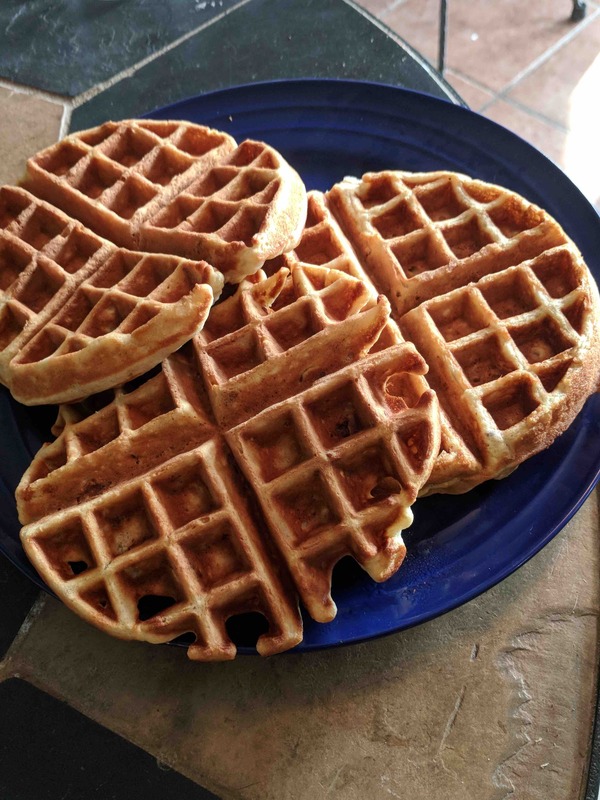 If you put the batter away overnight, pull it out of the refrigerator to warm up a bit as the waffle iron is preheating. Gently fold in the chopped pecans. Spoon 1/3 to 1/2 cup of batter into the waffle iron and cook for 3 to 4 minutes or until the waffles are brown. Serve with softened butter and maple or cane syrup. Can also be served with fried chicken. 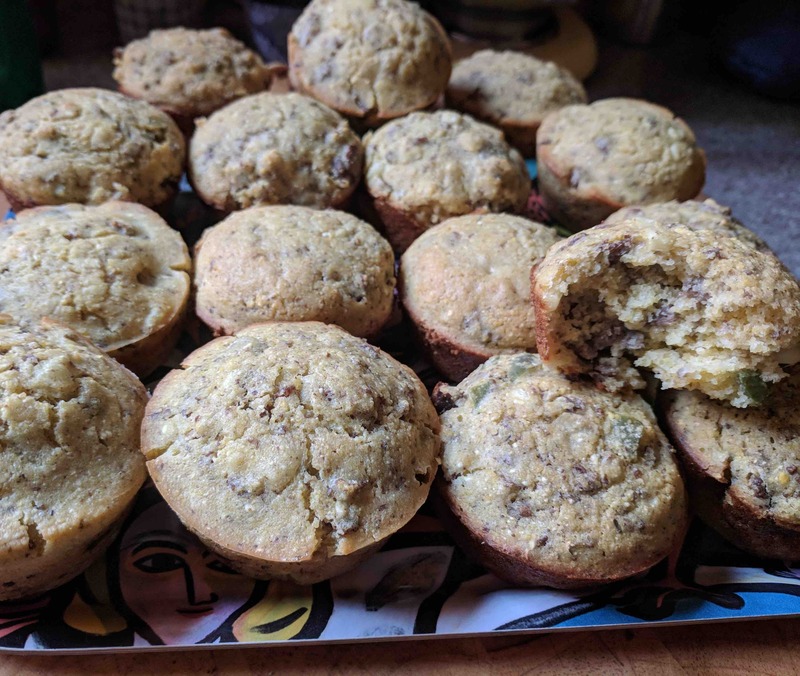 This item is popular on fast food menus and in the freezer section of grocery stores because it is full of yummy goodness. 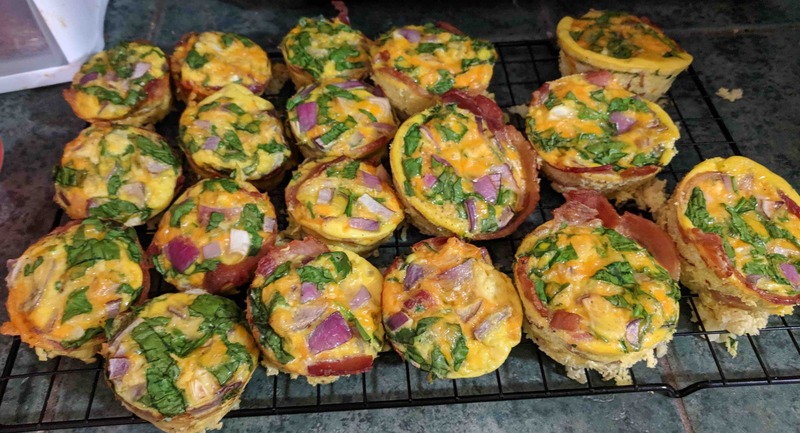 My version is scaled down for a breakfast for two but you can easily scale it up it to ensure you have portions for on-the-go meals later in week. Wash and cut potato into a small dice. Place in a saucepan with cold water and bring to a boil. Cook, stirring occassionally, until the potatoes are fork tender. Drain and let sit in the hot saucepan until needed. Brown sausage in a medium skillet. Break it into small pieces and cook until no longer pink. Remove from skillet to a paper towel covered plate. Place the potatoes in the skillet and brown slightly. Once they’ve gained some color, add in the diced bell pepper and cook until just tender. Remove from skillet. If necessary, add a tablespoon of butter to the pan. 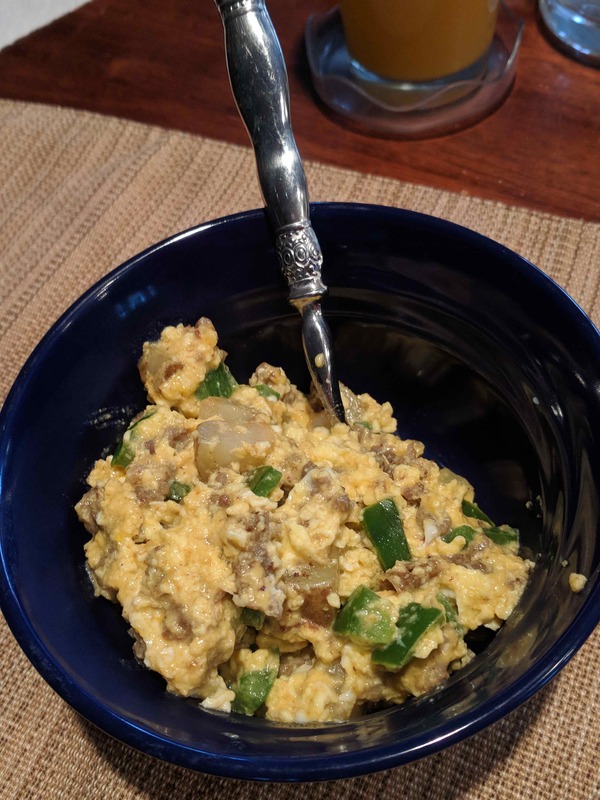 Scramble the eggs with the milk and sprinkle in some salt and pepper. Pour the eggs into the skillet and then scatter the grated cheese over the top. Gently stir the eggs to keep them soft. When done, add in the sausage, potatoes and bell pepper. Stir to combine and then distribute to bowls for devouring. To store and reheat: Place in an airtight container. Cool in the refrigerator before moving to the freezer. 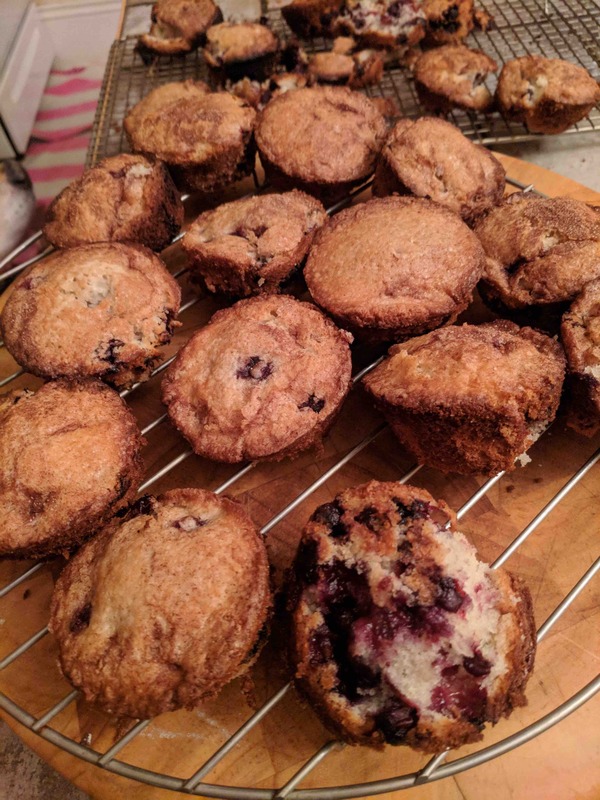 Place a portion (about 1 1/2 cups) in a microwave safe bowl. Defrost on half power for a minute before moving to full power for a minute to a minute and a half to heat through.